"If all the sky were paper, and the seas of the world an inkwell, I could not describe my suffering to you." by a 14 year-old Polish boy during World War II. 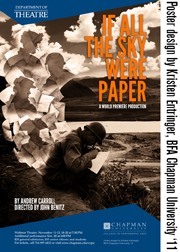 Also in the play "If All the Sky were Paper" based on Carroll's bestselling books.